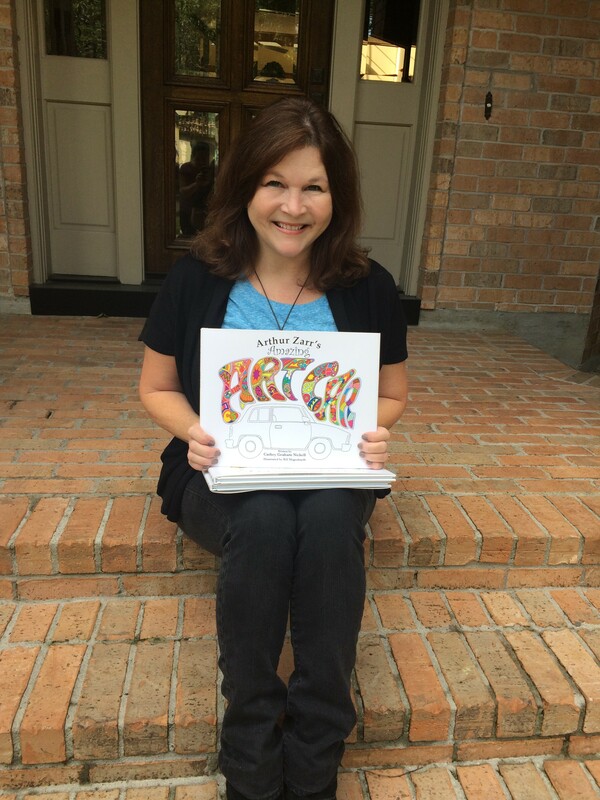 Cathey is an author and speaker based in Houston, Texas. 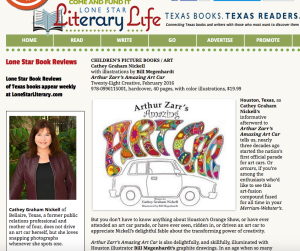 Lone Star Literary Life is a superb organization I discovered while producing and marketing my new children’s picture book, Arthur Zarr’s Amazing Art Car. This group connects readers with Texas writers and Texas books. I recently submitted my book to them for a review, and what I got in return is wonderful. CLICK HERE TO READ THE FULL REVIEW BY LONE STAR LITERARY LIFE. It was published in their Jan. 31, 2016 online newsletter, and I’ll clarify that I paid for this professional review. Some people don’t even realize paid reviews exist, but they do! It’s not always recommended for self-publishers, but in this case, it was part of my specific marketing plan. I was delighted that they praised my illustrator, Bill Megenhardt, for his original, crosshatched, hand-drawn technique. “Mr. Zarr grows from his grisaille existence into a citizen of a diverse, polychromed neighborhood.” – Lone Star Literary Life book review. READER REVIEWS ARE IMPORTANT. Why? I’ve been researching this topic for a long time, and here’s what I’ve learned. For all authors—but especially for indie authors like myself—reader reviews are vital to the success of our books. I’m not talking about paid reviews; I’m referring to a non-paid review from someone who read the book. Positive reviews can increase sales, increase visibility, grow an author’s newsletter, increase social media engagements, and much more. For example, HERE’S ANOTHER POSITIVE REVIEW I received by Paul McRae of Artcar Nation, a spectacular website dedicated to art cars. I didn’t pay for Paul’s glowing words, and I’m so grateful to him for the publicity. I wrote a fun blog about it, too. Reader reviews help get the word out and can create a buzz about a particular book. They also give potential buyers an idea as to what the book is about, which in turn might generate sales. Reviews can influence contagious behavior. I learned in my college marketing classes that it’s psychological. When products appear to sell a lot, they go on to sell even more. People want to know why something is popular, and they’re often willing to buy it to find out. There are also these mysterious processes that create suggestions on Amazon such as, “You might also enjoy this.” I’m still learning how these algorithms work. I’ve read that I need at least ten reviews on Amazon so that my book might pop up with “also bought” and “you might also like” phrases. At the time of writing this post, I have received 23 Amazon reviews in two months—all of which are positive. This brings up another issue: apparently it could look “fishy” if all my reviews have the highest five-star ratings. Readers might not trust the reviews if every single one is glowing, and I’ve heard it might help to have a few negative ones. Well, please don’t go post an unenthusiastic review! I’m quite sure those will arrive organically over time, because no book is universally loved by everyone. So sales are one thing, but there’s another reason why I might need favorable reviews from some respected groups like Kirkus and Publishers Weekly. I’m trying to submit my book for a few different publishing awards, and some of these contests require favorable reviews from specific key sources to even be considered. Many of these professional reviews cost money, however, and authors should cautiously weigh the cost vs. return on investment. THE PROBLEM is obtaining enough non-paid reader reviews. I would never stoop so low as to pay for a reader review on Amazon or Goodreads; plus, it’s considered unethical, so don’t go down that path! Authors run the gamut from gently suggesting to outright begging everyone they know for reviews. It only takes a few minutes, but getting someone to actually sit down and write a review is not easy. I’m batting about 10:1. Meaning, for every ten people I’ve asked to write a review, I’ve gotten about one person to follow through. I’m not complaining; just stressing how hard it is to get book reviews. I don’t plead; I ask once and leave it at that. If you want to learn more, you can google “Why Book Reviews are Important,” and you will discover a wealth of information. To those dedicated individuals who posted honest reviews about my book: Thank You! I sincerely appreciate the time it took for you to sit down and finish this task. I don’t take it for granted, and I am grateful to my two dozen or so reviewers (with that number growing, I hope). If you’re reading this blog and haven’t written a review yet, please do so. I know your time is valuable, but it matters so much! don’t forget to hit SUBMIT! Thank you so much, and I hope you enjoy the attached book review by Lone Star Literary Life as much as I did! Here’s another link for you to read the whole review. 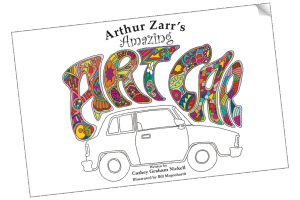 My first children’s book, Arthur Zarr’s Amazing Art Car, has arrived! A few silly bumper stickers triggered the concept for my new picture book. Nothing big. Just a twinkling of an idea that started small but took flight. And for my book’s main character, Arthur Zarr, it all began with an acorn that fell from a tree. The costs that my book project incurred started off small, too. However, the expenses quickly grew, and while I don’t want to discourage anyone from self-publishing, I’ll be frank. It’s expensive to develop a hardcover book with dust jacket, complete with hand-drawn illustrations and Smythe-sewn binding! But my goal was to create a professional-looking book—one that could hold its own next to those developed by big publishing houses. So, I had to be willing to make a financial investment. I’m glad I did. (Note: e-books and print-on-demand books are considerably less expensive, but I had other plans in mind). After a long ride from Canada, the books arrived this week. Like any proud mother, I can only see perfection when I look at my new baby. It will soon launch on Amazon (today, I mailed cases of books to three different Amazon Fulfillment Centers! ), as well as Barnes and Noble, independent bookstores, gift shops, schools, libraries, my website, etc. Give me a few days, and it will be available for purchase by next week. (Update 2018: My book is selling well and still available on AMAZON!). Am I a Legitimate Author? If I had a dollar for every time I’ve been asked that question… it wouldn’t make me a millionaire, but I bet it would buy me a few tanks of gas. It’s funny, because a big-name publisher has not published my work. Nor a small publisher. Still though, it seems that some are noting my humble progress, and they’re asking how I’ve done it. You’ve heard the well-known quote: “How do you get to Carnegie Hall? Practice, practice, practice.” Well, I’ve discovered that “getting my book published” and “getting on Amazon” takes a lot more than practice. I have two books under my belt. The first—a historical nonfiction—was published in 2012, with a revision and second printing in 2015. 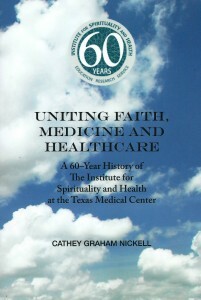 Uniting Faith, Medicine and Healthcare: A 60-Year History of the Institute For Spirituality and Health at the Texas Medical Center was the result of a freelance writing job. A Houston non-profit organization, called the Institute for Spirituality and Health, hired me to conduct interviews, research their annals, and develop a cohesive, historical chronicle of their years from 1955 to 2015. The Institute project was unique because (1) I was well paid to write the book, and (2) the Institute funded all production costs to publish it. So, from a financial standpoint, I didn’t have to front the required capital. I didn’t take on any risk, other than my reputation as a writer. Since we chose to self-publish, I was able to skip the process of finding an agent, editor, or publishing house. I understood the publication process, thanks to my former years as a journalist and public relations professional. My second book—a children’s picture book—has been an altogether different endeavor. In January of 2014, I came home from carpooling my son to school with a book idea. I sat down at my computer and created Arthur Zarr’s Amazing Art Car. I wrote the first draft in one sitting that took up most of my day. 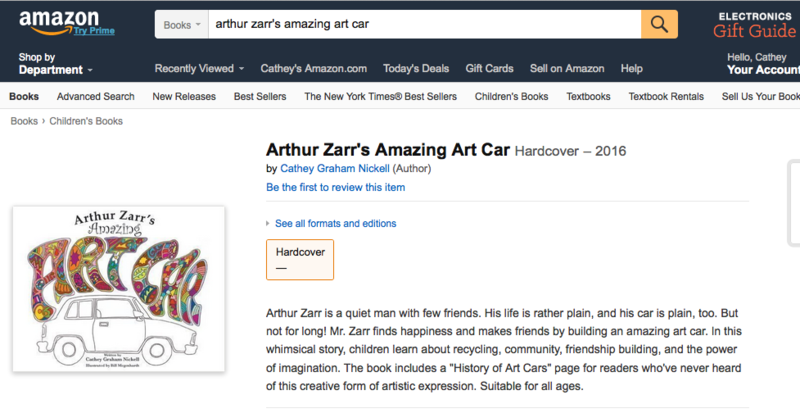 I felt it was an original story, and, after some research, I discovered that it would be the first children’s picture book on the topic of art cars. This led me to various appointments where I discussed my idea with smart, creative people. I considered self-publishing, and most everyone I talked to encouraged me to move forward with this idea. The problem was that I wanted to feel legitimate. To me, that meant finding a “real publisher” or an agent. I couldn’t shake the notion that I wouldn’t be taken seriously if I self-published. Anyone can self-publish a book, was the nagging thought in my head. I discovered a small publisher that accepted non-agented work, and I mailed my manuscript off. I waited. And waited. After two months, I emailed the editor there, and she surprised me by writing back, saying that she was eager to read my story and would soon get back to me. I waited some more. And waited. I never heard from that small publishing house. Looking back, I’m glad they didn’t respond. Undeterred, the months I spent waiting on that publisher’s call gave me time to develop a new plan. 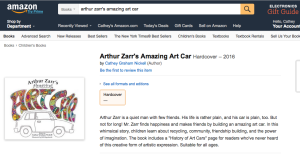 Ten months had passed since writing that first draft of Arthur Zarr’s Amazing Art Car. By this time, I had revised it dozens of times. I felt even more attached to my character and the dream of seeing Arthur come to life. 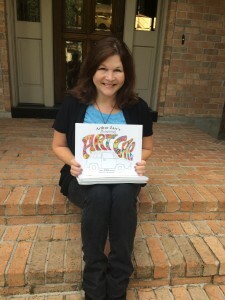 I hired a local children’s book illustrator, and the real work began. My constant narrative of “anyone can self-publish a book” wasn’t true. Producing my picture book has been a daily job that has required thousands of hours of proofreading, researching, learning, creating business/marketing plans, conducting cost comparisons, etc. I studied the basics of web design, blogging, social media, and building an author platform. Self-publishing is hard work that’s not for the faint of heart or for the faint of wallet. In addition to the costs incurred in publishing a book, I’ve also taken courses, attended conferences, joined organizations, listened to webinars, and bought numerous industry books. Producing a hardcover picture book complete with dust jacket is an expensive endeavor with no promise of reimbursement through possible sales. But something special happened to me during the process of creating and producing Arthur Zarr’s Amazing Art Car. I grew in terms of creativity, productivity, and confidence. I’m not sure how, but I whittled out time to write a middle grade book that is currently in the rewrite phase (and that I might produce next). I revised the non-fiction book for the Institute for Spirituality and Health, and I produced its second printing. I completed my thesis and earned a master’s degree. I served as a paid consultant on a book project for another non-profit Houston organization. I helped a new acquaintance self-publish her book of poetry called Conscious Transformations: Within Me, Within You (by Marla Maharaj, for sale on Amazon). I assisted my parents as they sold their home and moved into a new house. I was a friend, a mother, a stepmother, a daughter, a sister, and a wife. At first, I was afraid to put my writing, my books, and my ideas out into the world with no assurance of acceptance or appreciation. But as the inspiring author Brené Brown says, I think I’m “daring greatly!” I feel like a legitimate author. I can’t wait to open that first case of books in two weeks. Loveable Arthur is almost here! Hi guys! I’m a big fan of actress Valerie Harper. Like so many teenage girls, I identified with Rhoda Morgenstern on the 1970s Mary Tyler Moore Show. I love something Valerie said once, “Don’t let your fear today rob you of a fun life.” Since Valerie’s been battling cancer for about five years, I figure she’s an expert at making each day count. That’s the kind of person I strive to be. 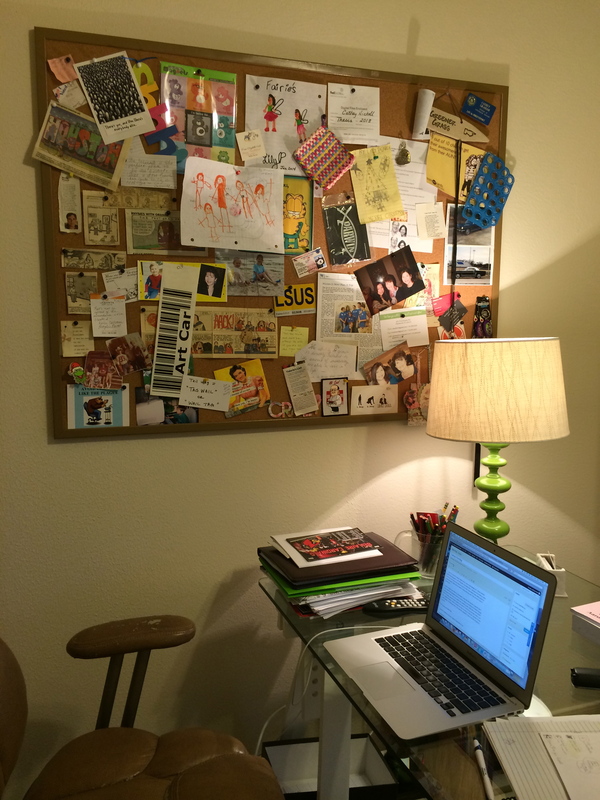 I write in a bright sunny office at my home here in Texas. My workspace features a large cork board that’s covered with inspirational notes and pictures. Pretty much anything that interests me goes on the board. On one scrap of torn paper, next to Valerie’s quote, I jotted down another phrase I like: “The ability to grow is directly related to the amount of insecurity you are able to take in your life.” I guess that means I need to do things that make me anxious! That’s how I approach my new writing career… It’s a little scary when I think about the possibility of failure, but that’s not going to stop me. Thanks for reading my first post. Hopefully I’ll get better as I go.